People, this is not health food. Though at this rate, that probably should be the new name of this blog: thisisnothealthfood.com. It isn't easy to cook for a single person, especially a single person with an extraordinarily low tolerance for monotony, an extreme commitment to thrift, and an eye-roll-worthy distaste for leftovers. I do, however, dislike leftovers—that slump of defeat it's all too easy for single people to slide into when eating out, driving through, or microwaving seems infinitely more appealing than eating for days reheated meals from the same recipe, most of which seem to be composed with only the four-or-more in mind. If you read yesterday's post (and I know you did, you loyal reader, you), you have a good sense of the ingredients I was working with. You might not be aware that I also had a bag of freezer fries on hand, but only if you don't know me particularly well. I consider this to be part of my emergency readiness plan: Find dog. Find fire exits. Find potatoes. Always be prepared, I say. I also recently discovered that my not-all-that-great local grocery store sells pretty great ciabatta, which is quite a surprise in my neighborhood. That was all I had to buy to make this meal happen. This one was pretty straightforward—no big revelations or caveats—because it is, after all, a sandwich. 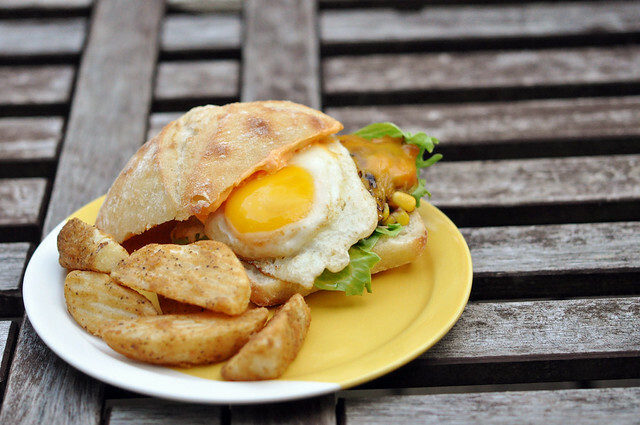 A sandwich I topped with no less than cheese, egg, and mayonnaise, and served with French fries. It was simple and satisfying and delicious, and not in the least like what I ate the night before. But this is not health food, people. 1. Combine first 6 ingredients in a small bowl, and mash with a potato masher. Set aside. 2. Combine mayonnaise and sriracha in a small bowl, set aside. 3. Combine chicken and black bean mixture; shape into a patty. Heat oil in a nonstick skillet over medium-low heat; add patty, and cook 1 to 2 minutes on each side or until lightly golden and heated through. Top with cheese, cover, and cook until cheese melts. 4. Place lettuce on bottom half of ciabatta roll; top with cooked burger. 5. Crack egg into skillet; cook, over medium-low heat, until whites are set but yolk is still runny. 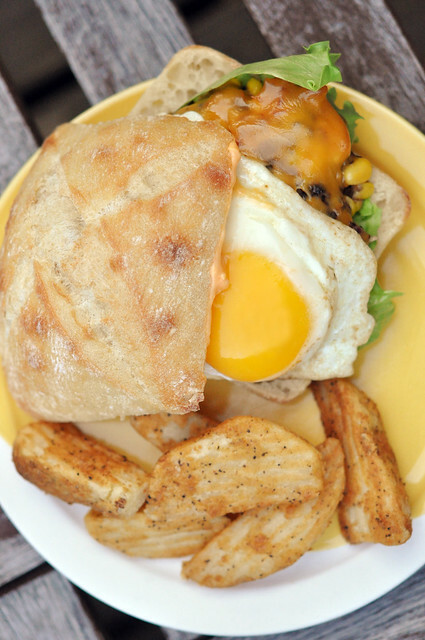 Top burger with sunny side up egg. 6. Spread mayonnaise mixture over top half of ciabatta roll, and place over egg. Serve with French fries, if desired. Makes 1 serving. This sounds amazing! I don't love leftovers but have learned to be creative with them when cooking for just 2 especially since the hubs may dislike them more than you! This will absolutely go into my rotation for the next time I have leftover chicken. That's sweet- love the idea of the egg and it's yolk on the chicken. My kind of messy sammie. Made your recipe tonight with a few changes. Delicious, thanks for sharing! !